Following a meeting with His Royal Highness Prince Khalifa bin Salman Al Khalifa, Prime Minister who briefed them on the success of Bahrain in the field of sustainable development and the prevailing features of tolerance and co-existence among all its people and its pioneering steps in the field of democratic development, the former Prime Minister of the Kingdom of Norway, Mr. Kjell Magne Bondevik, President of the Oslo Centre for Peace and Human Rights, and Mr. Aamir Javed Sheikh, head of the Dialogue for Peace and President of August 14 Committee of Norway visited yesterday the Shura Council and the Council of Representatives. They were received by Speaker, Fawzia bint Abdulla Zainal and Shura Council Chairman,. Ali bin Saleh Al Saleh. They were briefed by on the mechanisms of the two councils and their committees, the democratic process in the Kingdom of Bahrain, as well as the role both chambers play in the development of the Kingdom. Mr. Bondevik hailed the development, progress and development of the Kingdom of Bahrain in various fields, especially the democratic development. He praised Bahrain for strengthening its position and positive role regionally and internationally, appreciating the outstanding initiatives of the Kingdom of Bahrain on the international level and its support to the efforts aimed to spread peace and achieve the goals of sustainable development. She said that the Kingdom of Bahrain, under the wise leadership of His Majesty King Hamad bin Isa Al Khalifa, has a unique and historic experience to be proud of in terms of tolerance, pluralism, peaceful coexistence between religions, and society. “Bahrain has become one of the leading countries in this field”, she said. She expressed her deep appreciation for the civilisational and humanitarian initiatives of His Majesty the King in promoting and consolidating the values and principles of peaceful coexistence through a number of initiatives, which have strengthened the international standing of the Kingdom of Bahrain, in addition to the efforts of His Majesty and directives to intensify endeavours to protect and promote these values in order to achieve world peace and ensure security, stability and comprehensive development in the countries of the world. She also paid tribute to the efforts of His Majesty and directives to intensify endeavours to protect and promote these values in order to achieve world peace and ensure security, stability and comprehensive development in the countries of the world. She went on to say that supporting stability, peace and peaceful coexistence is one of the most important orientations of the Kingdom of Bahrain, which the international community seeks to implement and requires concerted efforts and coordination of share efforts by all parties and institutions. Shura Council Chairman affirmed that the Kingdom of Bahrain is an oasis of peace and coexistence, characterised by an atmosphere of openness and democracy and keen to build cooperation relations with various countries. He pointed out that the Kingdom of Bahrain is interested in developing its relations with all countries in order to promote peace, international tolerance and interfaith coexistence worldwide through the initiatives launched by His Majesty the King, which would contribute to confronting extremism and challenges facing different countries of the world. The visiting delegation toured a number of national companies and industrial establishments in the Kingdom including the Gulf Petrochemical Industries Company (GPIC), where they were received by the Company’s President, Dr. Abdul Rahman Jawahery, who briefed them on the company's departments and role in enhancing the development process and upgrading the petrochemical industry. 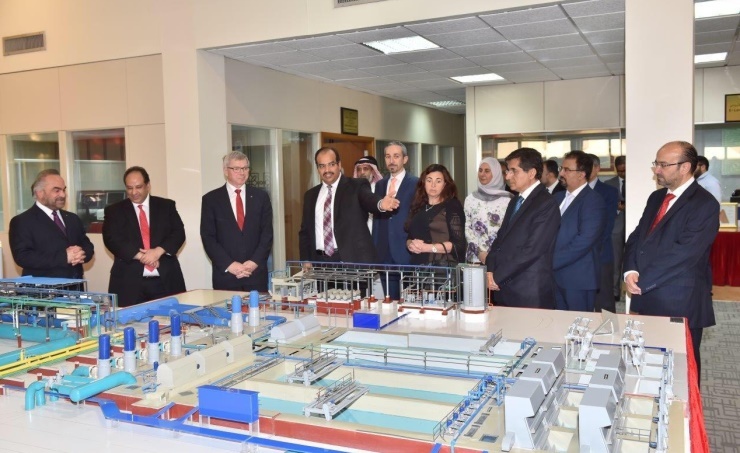 During the tour, Mr. Kjell Magne Bondevik and Mr. Aamir Javed Sheikh praised GPIC's high level of industrial sophistication, which, they said, is similar to giant oil companies, stressing that Bahrain is experiencing a modern industrial development that is compatible with all developments in various fields. They said it is distinguished by its qualified human resources, which have contributed to enhancing Bahrain's leading position in the field of sustainable development. Dr. Jawahery welcomed the visit, stressing its importance in terms of introducing and demonstrating the Kingdom of Bahrain’s progress and development in various fields. He pointed out that Bahrain's successes in terms of sustainable development are a source of pride for all its citizens. He pointed out that the major national companies, especially GPIC, play an important role in serving and developing the national economy and strengthening Bahrain's position on the regional and global levels in the field of oil and refining industries. The visiting delegation also toured a number of religious, heritage, artistic, cultural and developmental sites including The Sacred Heart Church, St. Christopher's Cathedral, Hindu and Buddhist temples in the Kingdom. They expressed their admiration of the values of tolerance and coexistence that characterize the Kingdom of Bahrain, and the availability of facilities necessary for for followers of other religions and sects to practice their rituals. They also stressed that Bahrain is a leading country in religious pluralism and culture. They added that the Kingdom of Bahrain's experience in supporting the principles of peace, love and coexistence deserves to be circulated to the world, pointing to their pleasure of this visit, which gave them the opportunity to get to familiar with the Bahraini people closely and to see its cultural approach.